In the last part of this series, we will look into last two core drives of the Octalysis framework of Gamification by Yu-kai Chou. Unpredictability & Curiosity is a core drive which is based on the fact that people are always inclined towards experiences that involves uncertainty and unpredictability. One of the reasons why slot machines are extremely popular and addictive to some people. The last core drive of Octalysis is Loss & Avoidance. This core drive motivates users to take an action against time just so that they avoid loss in the form of money, time spent, or effort. In Farmville, if you don’t harvest your crops within a specified time period, they die away. This motivates the users to log into Farmville, at even awkward times, just to ensure that their time, ‘Farm Cash’ and effort doesn’t wither away like the fake crops that they grow on Farmville. We will look deeper into these 2 core drives with relevant examples of apps that have utilized them. In the 1950s, B.F. Skinner described a cognitive peculiarity called Variable Schedule of Rewards. He coined a new term into the Law of Effect called Reinforcement where behavior which is reinforced tends to be repeated (i.e., strengthened); behavior which is not reinforced tends to die out (i.e., weakened). Skinner observed lab mice in a ‘Skinner Box’ where the mice were given random rewards on pulling a lever. At times they were given a small reward, sometimes a big reward or nothing at all. What’s peculiar is that the mice that were given random rewards pressed the lever compulsively than the ones that were given the same reward every time. Similarly, humans (being genetically identical to mice) would expect a different reward when the same action is performed. Like the mice in the Skinner Box, gamblers mindlessly pull away from the lever of slot machines just to try their luck if they win the $939,393 which they would never win in their lifetime. Unless you’re this woman from Hawaii. Slot machines have somehow capitalized on the reward system of the human brain, bringing in casinos an estimated $269,527,000 from 38,434 slot machines in operation at the Strip’s 40 locations, which is a HUGE amount of money. One such app which is using this core drive to improve their user engagement is Tez. 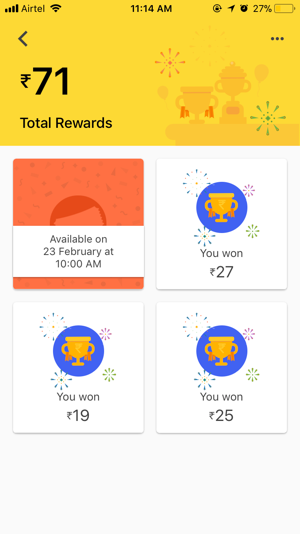 Every time you transfer money using Tez, you receive a scratch card from which you would receive anywhere between ₹10 and ₹1000, which motivates us to keep using the app to transfer money just to see how much money we would get from the scratch cards. This core drive motivates users to take an action against time just so that they avoid loss in the form of money, time spent, or effort. This can be noticed in Farmville where if you don’t harvest your crops within a specified time period, they die away. This motivates the users to log into Farmville, at even awkward times, just to ensure that their time, ‘Farm Cash’ and effort doesn’t wither away like the fake crops that they grow on Farmville. To simply put, users regret the loss of time and effort rather than the actual loss of fake virtual crops. To some users, their farms are more like a status quo to show off to their other virtual farmer buddies on how beautiful looking their fake virtual farm is. In order to avoid the loss, they go to any extent to save their crops before they wither away. Having this simple game mechanics into Farmville has skyrocketed its daily active users with this core drive. If you notice the “Lightning Deal” section, it says the deal ends in approximately 11 hours. So, if you are a big fan of Fifa and were looking to buy that game, it creates some pressure in your head that if you don’t buy it within the next few hours, you’ll lose that deal forever! Just to prevent the loss of not buying this game before the “Lightning Deal” expires, you would buy the game to prevent a sense of loss and avoidance. This is the last part of the Gamification in Design series. I hope you learned a thing or two about how you can apply the several core drive of the Octalysis framework. Special thanks to Yu-kai Chou for sharing his knowledge on game design and creating the Octalysis framework, without which you wouldn’t be reading this piece of text right now.